Adapted from Gumbo Love: Recipes for Gulf Coast Cooking, Entertaining and Savoring the Good Life by Lucy Buffett. Cooking has been one of the greatest teachers in developing my character. It can be instantly rewarding — a grand celebration of flavor. Or it can turn quickly into a life lesson, keeping you humble with lots of opportunities to learn about loss, imperfection, acceptance, perseverance, grief, willingness and ultimately a simple forgiveness that leaves you with a choice to either throw in the dishtowel or try, try again. My kitchen has become my sweet, safe haven, and cooking has become one of the most joyous activities in my life. As a matter of fact, I can put these life tools to use more easily in the kitchen than I sometimes can in real life. So don’t be surprised if some of these guidelines not only help keep your kitchen running smoothly but also help you out of a real-world jam or two. 1. Believe that life is always working for you, not against you. Things can go wrong in the kitchen — they inevitably do, no matter how prepared you are. But I’m a firm believer that there is always a good reason for everything. We just have to be willing to wade through the challenge and be open to the lesson. Nothing can change negativity faster and more sweepingly than gratitude. I was once preparing a meal for over a hundred people on a charter yacht in New York City. They were waiting patiently for their dessert, but my key lime pies simply would not set up. I couldn’t think anything beyond, This is a disaster! I couldn’t get beyond the looming sense of failure and dismay. And then one of the waitstaff came up with a brilliant idea: key lime mousse with graham cracker morsels! Guess what? We put away the pie plates and started scooping that runny pie, whipped cream, and raspberries into dessert bowls! It was a huge hit. And I learned a great lesson about trusting life and being resourceful, even in the face of what looks like a disaster. Later, that dessert actually became a menu item that was favored by many guests as the best and most interesting take on key lime pie they had ever eaten. I still giggle thinking about that night. 2. Life is; just live it! Or maybe the better way to say it is, just cook it! Focus on what is working and what you do have in the here and now. You thought you had oregano, but when it’s time to add it, you realize you must have used it up last time. Or maybe you have all the ingredients, but you don’t have enough of one thing or another. Instead of getting tripped up by what’s not there, improvise — be open to the “whatevers” and move forward with what you do have. You might even create something with a different slant or flavor that’s better than the original. Making do with what you’ve got is what gets the creative process going. I’d bet most every chef discovered at least one of their favorite recipes simply because they were out of some ingredient and were forced to get creative. I’m convinced that the secret to being a great chef is not how well you can cook but how well you can problem-solve. 3. Trying to be perfect is a setup for failure. I am a type A personality, as are both my siblings. Maybe it is genetic or maybe we just found out a lot of times growing up that “a job worth doing is a job worth doing right,” echoing the words of our father and his father before him. And as much as we have benefited from living those words and achieving great things in our lives, at times that philosophy has been a harsh master to serve. Because life is not perfect. We are not perfect. We can learn from our mistakes. There is simply no room for anything harsh in my life these days, and I am much more kind to myself than I used to be. 4. When you don’t know what to do, DO NOTHING. If I’m out of options or running in circles trying to find a solution or make something happen, I’ve found that I’m trying too hard. I need to breathe. I need a moment to get still so I can hear what life wants me to do. Kitchens can be chaotic. Ingredients here and there, a spill, different times and temps for different dishes. When you feel the heat building and the countertop starting to spin, stop what you’re doing and take a deep breath to get your bearings. Have a cup of coffee. Take a sip of wine if that helps. Or a bite of ice cream. Just be still and be in the moment and you’ll be surprised — the knife you were looking for is right there in front of you. One way to avoid some of the chaos is to prepare all your ingredients and implements ahead of time with veggies chopped, bowls lined up and whatever tools you need at the ready. 5. You are the cook of your own kitchen. Take responsibility for your successes and your failures. You know what they say about too many cooks in the kitchen. 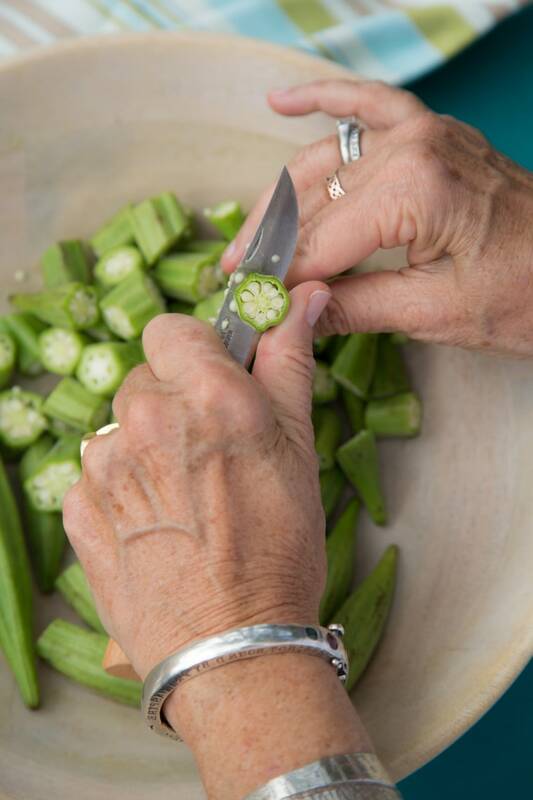 Everyone has their own way they like to do things; everyone thinks their gumbo or their mama’s gumbo is the best. But you’ve got to make your own gumbo. Your recipe comes from using your own favorite ingredients, your own family traditions, what you’ve learned from your own experiences — good and bad — in the kitchen. That doesn’t mean someone else’s gumbo is wrong. In fact, with an open mind you may be able to pick up things here and there that you’d like to add to your own. Sometimes you’re going to have to improvise. Listen to your cooking instincts; the kitchen diva is always whispering in your ear. I’ve finally figured out my life’s recipe, but it took me a whole lot of time in the kitchen to get there. Lucy Buffett is the successful restaurateur of two locations of LuLu's in Gulf Shores, Alabama and Destin, Florida, where she serves over a million guests a year.